Accumulation and reservoirs, clearance and degradation, toxicity and dosage are highly important characteristics of new pharmaceuticals that can be determined by studying molecular distribution. Knowledge of molecular distribution throughout the body and across organs is vital in understanding the function of pharmaceutical drugs and native biological molecules. Traditionally, autoradiography of sections and positron emission topography have been the methods of choice for investigating molecular distribution. These techniques rely on radioactively labeled tracers and allow the user to study a single molecule at a time, which are quite serious limitations. Recently, imaging of molecular distributions in thin tissue sections using mass spectrometry has matured to be a realistic complement to these established techniques. Mass spectrometry imaging (MSI) offers a range of advantages over traditional methods as it allows for a simultaneous study of a wide range of molecular distributions. It is not reliant on radioactivity-labeled tracers or other a priori information of the sample, which thereby makes it highly suitable for both explorative as well as confirmative research. The main benefit of MSI compared to traditional methods is the technology’s possibility to create distribution images for any number of compounds and metabolites from a single experiment. The use of MSI will increase analytical speed and accuracy as well as reduce cost. It also provides data that has previously been very difficult, if not impossible, to generate in a single run. This makes MSI a very promising technique that has the potential to revolutionize the ability to study molecular distribution in tissue. So has MSI no limitations? Naturally, there are a few problems that need to be addressed before MSI can reach its full potential. One of these problems is the continued changes in molecular composition due to residual enzymatic activity during sample preparation. Few, if any, enzyme inhibitors can be used in MSI as they interfere with the downstream mass spectrometric analytical instrumentation. Lack of usable inhibitors in combination with thin tissue sections that thaw during processing leads to massive changes of molecular levels as well as creates ex vivo degradation fragments that both confound and confuse interpretation of results. Denator has developed an additive-free heat-stabilization technology that utilizes conductive heating, under controlled pressure, to rapidly and irreversibly eliminate enzymatic degradation or changes in tissue samples. This preserves the quality of tissue samples from the moment of excision throughout the entire workflow thereby increasing the accuracy of downstream analytical results. The company’s Stabilizor system can readily be combined with MSI, thereby overcoming the major limitation of MSI today. Endogenous peptides play important roles as hormones and signaling molecules in the body. They are generally formed by enzymatic processing from precursor proteins and, once released, these peptides tend to degrade rapidly. This results in the existence of several other processing forms of the original peptide, which can have both longer and shorter amino acid sequences in comparison: The potential function for these processing forms are unknown or even unexisting. This rapid degradation makes it challenging to investigate spatial distribution of active endogenous peptides. It is therefore crucial to avoid introducing further enzymatic processing as this will disturb the in vivo localization and complicate the analysis of distribution. Richard Goodwin, Ph.D., (AstraZeneca and Uppsala University) has pioneered use of Denator’s heat stabilization technology in the MSI workflow to stop post-sampling changes. 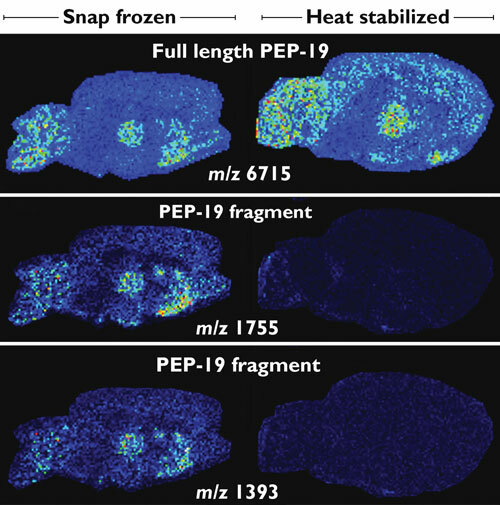 In a study of the distribution of the neuropeptide Pep-19, a 6.7 kDa polypeptide found primarily in the brain, the intact peptides were found at higher levels in heat-stabilized samples compared to snap-frozen samples. In addition, two shorter forms of the peptide could only be detected in snap-frozen sections. This clearly indicates that they were formed during the MSI sample processing as degradation products (Figure 1). Figure 1. MSI comparison of snap-frozen (left column) and heat-stabilized (right column) rat brain tissue: Samples were washed prior to matrix application and analyzed by Ultraflex II in positive ion linear mode (DHB matrix at 150 µm spatial resolution). The intact peptide, PEP-19, was found at higher levels in heat-stabilized samples compared to snap-frozen samples. In addition, two shorter forms of the peptide could only be detected in snap-frozen sections. These fragments were not detected in heat-stabilized samples indicating they were created during sample handling as degradation products. Post-sampling, ATP-levels drop rapidly due to loss of oxygen and aerobic metabolism. Anabolic cellular activity on the other hand continues, and ATP as well as other tri-phosphate nucleotides will be consumed and the lower-energy di- and mono-phosphate equivalents created. It is essential to prevent changes during sample processing if one want to study tissue distribution of nucleotides and nucleotide analogs. Elle Blatherwick, Ph.D. (University of Warwick), has studied and compared the distribution of ATP, ADP, and AMP in both snap-frozen and heat-stabilized mouse brain. In heat-stabilized samples, the levels of high-energy ATP were detected at higher levels compared to low energy AMP, whereas the reverse situation was found in snap-frozen samples. 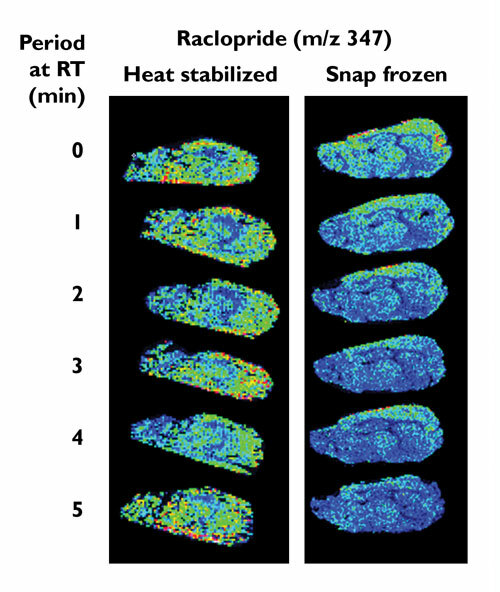 The lower ATP/AMP ratio in snap-frozen, compared to heat-stabilized samples, clearly indicates continued metabolic activity during sample preparation (Figure 2). To confidently be able to study the levels of nucleotides in tissue sections has an immediate application in medical research where nucleotide analogs are used as antiviral and anticancer drugs. These are given as mono- or di-phosphorylated forms and are then further phosphorylated inside the cells. Heat stabilization in combination with MSI allows for the distribution of all phosphorylation stages to be assayed without the risk of interconversion between the forms during processing. Figure 2. MSI comparison of ATP distribution in snap-frozen and heat-stabilized mouse brain tissue: In heat-stabilized samples, the levels of high-energy ATP were detected at higher levels compared to low-energy AMP, whereas the reverse situation was found in snap-frozen samples. 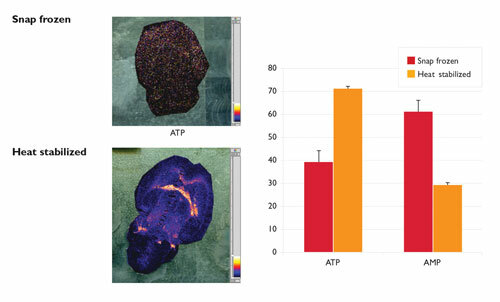 This indicates that the metabolic activity has been halted in heat-stabilized sample thereby preserving the high-energy ATP that otherwise would have been depleted. Pharmaceutical drugs are metabolized in the living body, either to become activated, as for the case of pro-drugs, or inactivated in order to avoid toxic effects of accumulation. This metabolization can also continue post-sampling, which changes present levels as well as relative composition and parent-to-daughter ratio of the drug, thereby resulting in inaccurate analysis of the drug’s efficacy and/or presence in the body. Figure 3. MSI comparison of Raclopride abundance in snap-frozen and heat-stabilized 14 mm Raclopride-treated (i.v. single dose 2 mg/kg) rat brain tissue sections mounted over a five-minute time period at room temperature. Analysis performed by MALDI/TOF at a spatial resolution of 200 mm. Tissue sections coated with CHCA matrix using solvent-free dry coating method. In snap-frozen samples, Raclopride (m/z 347.0) abundance decreases with increased duration at room temperature indicating enzymatic degradation. In heat-stabilized samples, Raclopride abundance remains at the same level during the five-minute interval at room temperature indicating stability. Dr. Goodwin has also studied the distribution of raclopride (an antagonist binder to the D2 dopamine receptor with a body half-life of 30 minutes) in mouse brain tissue. Results show that the distribution of raclopride remained consistent in heat-stabilized samples while the amount of small molecule continuously decreased due to rapid degradation, even during time intervals as short as five minutes (Figure 3). It is evident that MSI has the potential to complement or even outperform traditional imaging techniques for the study of molecular distribution in tissue samples. But continued metabolic activity during sample preparation can seriously affect the detected levels of small molecules and result in the risk of incorrect data interpretation and misleading conclusions. Heat stabilization of tissue samples, using the Stabilizor system prior to MSI, overcomes this problem by eliminating the risk of enzymatic degradation or metabolic changes during sample handling. The user can therefore confidently analyze the correct molecular distribution of a small molecule. Mats Borén, Ph.D. (mats@denator.com), is head of development at Denator.